After visting Morroco, intrest came up to go to Turkey as well. So this time Turkey by bike, not every thing went as "planned". Our idee was to cycle 3 weeks in Capadocia. Capadocia has a very strainge landscape it is vulcanic. By erosion the scienery is spectecular reshaped. Only the hard cores of the vulcanos still exists. The average altitude is about 1000m and roads are not so steep in general. We landed on the old airport terminal this was also the last week it was open. On our way back to Holland we had to depart from the new terminal that was build 1km further. The bikes where undamaged only one bag was missing :-(. The airport official said that they will send it by the next flight. That bag contained the sleeping bags, panniers + kitchen, so quite important stuff. After three quarters of and hour of language problems Loes found a place to store our KLM bike boxes. However the boxes where safely store we didn't know how much it costs and if the boxes are still there after 3 weeks, since the terminal will move to an other location. 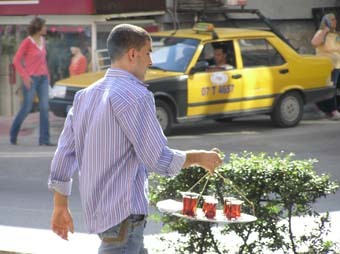 Problems for later, lets go to Ankara first! From the airport we cycled to Ankara over a brand new highway. On this luxiurous road with marmer side walk and wide sholders its quite suitable for cycling. But not the whole route it was that safe. Sometimes the traffic was too busy and we had to cycle at the unfinish sidewalk. Normally not a problem, now and then there was a hole of a meter deep in that sidewalk combined with the half darkness it became quite tricky. Finally we reach Ankara and found a simple dubble room (YTL23±12.4Euro). The first day in Ankara we walked a little bit in the city centre. The second day we wanted to leaf Ankara but the bag was not yet there in the morning, so we start calling. The airport offical said it will be there in 20 minutes. So we waited and waited. Two hours later notting again calling at the end at 16:00 a car came with the missing bag. Now the journey could really start. By bike we crossed Ankara. Lots of taksi and loud horning cars futher we reached the Asti OTOGAR the main bus station. From the Asti we took a bus to Avanos in Capadocia. Since our late departure that day from Ankara we reached Avanos in the middle of the night. In moon light we searched for the campside. The campside just at the edge of the village was closed, oke other plan find a hotel at two a'clock in the night. It seems easier than that it sounded. In the village centre there was a old man and woman carring a big shopping bag, but they didn't know. A guy from a cafe call a friend for us and the police driving around in a blue bus helped us to find the right house. In that way we waked up the following morning in a strainge bed not knowing exactly where we are. By looking out of the window we found out it was very beautiful outside. Nice mountain and blue sky... holiday has started! The longest river of turkey the Kizilirlmak (red river) with a lenght of 1.355 km is flowing through Avanos. After walking around in the centre we couldn't wait long to start cycling. After passing the end to Avanos road sign the landscape became so strainge. 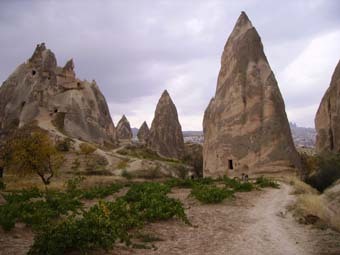 Alot of conical rock formations filled the landscape. The rocks are called Fairy Chimneys. Fairy Chimneys form typically comprises a thick layer of tuff (consolidated volcanic ash), covered by a thin layer of basalt or other volcanic rocks that are more resistant to erosion than the underlying tuff. Over time, cracks in the basalt allow the much softer tuff to be eroded and washed away. Some background:Fairy Chimneys are formed where a small cap basalt remains, and protects a cone of tuff beneath it from erosion. Eventually, the tuff will be undercut to the extent that the cap falls off, and the remaining cone is then quickly eroded.